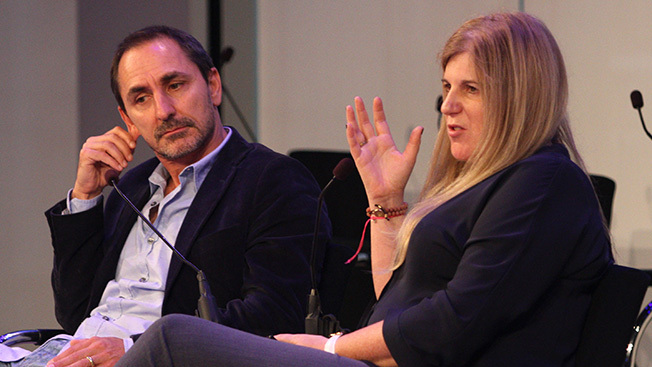 David Droga and Lorraine Twohill had plenty to say about mobile marketing and the advent of virtual reality at their Advertising Week session Wednesday. But first they discussed Google's logo redesign—which Twohill helped to oversee as svp of global marketing—and how it turned into a more taxing experience than she'd expected. Flipping a switch to have the new logo roll out globally all on the same day turned out to be a more complex task than anticipated for the engineers. But even more worrying, Twohill said, was whether the public would embrace the new mark. "When you work on something like that for months, you're just petrified and terrified," she said. "Even though a logo feels like a small thing, it's actually a very big deal, because this is a very loved brand. And logo changes don't necessarily always land very well. So, we were petrified that the world was just going to universally vomit when we put this thing out there. Thankfully, they didn't. We got a very nice response. We lived through it and survived, but it was stressful." "I like that that was the benchmark. Did the world vomit or not? Job done," added Droga, whose agency, Droga5, has worked with Google on advertising for many of its brands, including Android. For those who don't like the tilted "e" in the new logo (The New Yorker grumbled that the letter appears to be "showboating"), you can blame Ryan Germick, the leader of the Google Doodle team. "There was a lot of angst internally about changing this logo," said Twohill. "Ryan wrote to us and said, 'Could you at the very least tilt the 'e,' so it's smiling?' So, that's Ryan's 'e.' "
Droga, meanwhile, said he loved the new logo (not surprisingly, perhaps, as Twohill is, after all, his client). "I feel like the coolest guy you know just discovered a tailored suit," he said. With the logo love out of the way, the pair moved to the topic of mobile advertising—in Google's case, its campaign to get people to use its mobile app; and in Droga5's case, how to create compelling advertising in the medium. One of Google's biggest tasks has been getting iPhone users (i.e., those not on Android) to not only download the Google app but also to use it regularly. "We used to be good at marketing a URL. We've had to become extremely good at marketing apps," said Twohill. "Now, in my search campaign, over 40 percent of my spend is mobile advertising. Not digital, just mobile—to reach people when they're on their iPhones and encourage them to not only download the app but then go back in and use it." Still, mobile spend alone wasn't enough. "When we did mobile advertising, people would download the app," she said. "But when we turned on all the other assets of digital marketing plus offline, a combination of integrated marketing, that got them to not only download but go back into the app and engage with the app—because we were showing them ways to use it." Droga said that for creative agencies, mobile is less about the content or the canvas, and more about the context. "It's a bit of a reeducation," he said. "We always think about things in glorious canvases, on big screens. But as consumers, we consume most of it in our palms. You can't be too subtle in it. We talk a lot about context. We're an industry obsessed with the storytelling side of things, the content. And then we got obsessed with the canvas. Is it going to be on television? Is it print? And now the canvas is mobile. But what we really need to think about is the context. The context is where and when the person is consuming it—location, time of day. We're an industry that used to celebrate the fact that we created this thing. And now, what happens to it and where it is in the environment is as much about the idea as possible." Also, the personal nature of it is promising but perilous, Droga added. "The more personal it is, the more our industry and brands run to it because we think we've got this captive audience," he said. "But what was offensive online is even more offensive in your hand. That's why we have to be tactical about it. How do we make it more rewarding? How do we show some restraint?" Droga5 and Google have worked together for years, and have learned plenty from each other, the two executives said. Droga has admired Google's nimble creativity and speed to market. (Twohill said the company hires "athletes" to make this happen, and is much more comfortable these days rolling out things like Google Doodles that respond to breaking news—e.g., the water-on-Mars doodle this past week.) Meanwhile, Google—which was starting down this path already—has learned from Droga to even more fully embrace emotion is its advertising. "That's been a journey for us, too, frankly," Twohil said. "We used to create very rational stuff outlining the key features of a product. Often the product manager would be in the ad. But it didn't make people feel anything. We've thought about that a lot." As evidence, Twohill showed Droga5's "Friends Furever" spot for Android, with the found footage of different animals playing together, which was a huge hit—at almost 20 million YouTube views.